The Secret is devotional Communion with Me. Enter into My Sphere through devotion, and the “Brightness” will Outshine you, Outshine appearances, Outshine psycho-physical conditions and limits. Open this book to discover a portal into another world. Allow yourself to be transported into Avatar Adi Da’s radiant sphere, each page shining with His Word or Form. Now, for the first time in one book, you can enjoy Discourses from a wide range of His Teaching-Submission Years (1973 to 1995). Many of these 21 Talks have never been published in a book—or even in a printed form before! Enhancing the core theme of “Sighting” is a 16-page gallery adorned with 23 exquisite, seldom-seen sightings of Avatar Adi Da, chronologically arranged, one from each of those Teaching-Submission Years. "Have you all heard about the Dreaded Gom-Boo? Click here to read more from "The Dreaded Gom-Boo"
Have you all heard about the Dreaded Gom-Boo? Or the Impossible Three-Day Thumb-and-Finger Problem? Aha! You see? Nobody tells you about these things except Me. A myth has been circulating for many centuries now that humanity is diseased, that all beings are suffering from what I call “the Dreaded Gom-Boo”—also called “sin”, “maya”, “ego”, “suffering”, “separated individuality”, “illusion”, “delusion”, and “confusion”. You are supposed to accept this diagnosis, realize how diseased you are, and submit yourself to the local “religious” hospital—where a father or mother doctor will confirm your disease and require you to submit to various regimes for the rest of your life, for your own healing and ultimate cure. Such is the basic proposition of traditional “religion”—and it begins with the diagnosis of the dreaded disease. Tradition has it that, by birth, by virtue of their very existence, human beings are all—even now—diseased, “sinful”, separated from the Great One. What a horror! Yes! What an obscenity has been laid upon people through the traditions of society, which (merely because of the impulse to survive as the body-mind-complex) have for centuries required human beings to invest themselves with the belief in this disease and to suppress their own life-motion (which comes only from the Great One) in order to fulfill the presumed needs of this chaotic society. I have Come to Tell you, as I Stand in the midst of the priests of this horror, that not even one of you is suffering from this disease. It is an imaginary disease—a terrible disease, but altogether imaginary. No one has ever actually had this disease. Not one single being has ever had the Dreaded Gom-Boo, or the Impossible Three-Day Thumb-and-Finger Problem. It has never happened! It does not exist! What is the Truth? You are Happy. You live in Real God. The Great One Is your Very Being. You inhere in the Love-Blissful, Forceful Being of the Starry God—the Mystery, the Person of Love. This is your Situation and your Destiny. And this is My Message to you: There is no disease. There is nothing to cure. You are not a patient. And you are not parented, you are not a child. No dreadful destiny lies before you. There is nothing whatsoever to cure. Practice does not necessarily feel good. It is hot, and it is purifying. But that heat is what, over time, makes your tendencies obsolete. Eventually, you do feel much better—but in the meantime, you must live this process of purification. . . .
You want to feel like a Divinely Enlightened person before you have been consumed--before you have become Unconditional Love, before your tendencies have been made obsolete, before your tendencies have been transcended through devotional recognition-response to Me. Until most perfect "self"-surrender is the case, you will feel the heat of practice. . . .
[W]henever you truly participate in an occasion of My Darshan, My Fire is Given to you. That Fire is also the En-Light-ening Radiance, but Its fundamental effect is Fiery for a time. Inevitably, the Fire must Have Its Way. Outwardly, I appear to be Instructing you in this moment—but, by Means of My Siddhi (or Force) of Self-Abiding Divine Self-Recognition, I am, in Reality, Relating to the entire Cosmic Mandala (and, therefore, to all of you) as fresh clay pigs in My Kiln. . . .
All the while, This Force, This Siddhi of Self-Abiding Divine Self-Recognition, Exercised by Me, will be heating up the clay pigs. Eventually, they start glowing—you can still make them out as separate shapes, but they are glowing. At first, a little heat-radiation, blissful feeling, and so on. But you can still see them there, those wet little uglies! Then they start glowing a little more, everything starts glowing a little more. There is even a fiery redness about it somehow. You even see it directly. But still you can see those wet little uglies. And you there as a wet little ugly—but somehow “Brightened” up, and actually feeling uplifted! It just continues. And the “Brightness” is Magnified more and more by the Power of My Divine Samadhi, the Power of My Self-Abiding Divine Self-Recognition, active throughout the cosmic domain. Eventually, these little clay pigs stop feeling so bulky, so elementally earthy. They are somehow more blended with everything. They become rather subtle, seeing things subtly, and they start becoming “Brighter” and “Brighter” and “Brighter”. They are just a sort of universal glow, hardly any differentiation at all—just this Ecstasy, this “Intoxication” of “Brightness”. And, then—in a wink, without noticing—there is none of it left. No more clay pigs. No more cosmic domain. Every moment you practice “radical” devotion to Me, you leap back into the Kiln. That is every moment. Whenever you practice devotion to Me, you have leapt back into My Kiln of Brightness”—not only in the moments when you sit down for formal meditation. The more you are surrendered to the Radiance of Communion with Me, the “Brighter” you become. You are participating in My Siddhi of Self-Abiding Divine Self-Recognition. Yes, you are doing all of the ego-transcending practices I Give to My devotees—but you are also investing yourself in Me, being Moved by the Power of My Divine Samadhi, being Transformed by the Power of My Self-Abiding Divine Self-Recognition of the entire Cosmic Mandala. Both are Happening simultaneously. But all of It is in the Circumstance of My Kiln, My Infinite Space of “Brightness”. Your real “problem” is your “guru”—with a little “g”. You know, Little-ji—Sri Sri Little-ji? Yes. The body-mind-complex, or your separate and separative “self”, is Little-ji—the one who masters your life in every moment, and who is always telling you this and that. I Say something, and you immediately consult Little-ji to find out if what I have Said is correct. You do not simply accept My Word, embrace It, receive It. You only think about It. If you have to think about My Word, you are consulting Little ji. If you are straightforward and clear that I Am your Guru, plain old, and if you “Know” Who I Am, then you would not be thinking about My Word. You would simply receive It absolutely. It would utterly Transform you. Yet, you do not receive My Divine Avataric Self-Confession and My Divine Avataric Demonstration in that manner. You think about what I Say. You do something that you call “consideration” of My Word—meaning that you consult your own body-mind-“self” to see what you will do about it. You consult Little-ji. You follow Little-ji—not Me. Of course, you also respond to Me and do some kind of practice. But you have taken a long time to do anything that makes a real difference. In the meantime, you resort to Little-ji. That is what you do most. You were bullshitting when you said your worst fear is to be separated from Me. It is not true. There is not the slightest truth in it. Your worst fear is to be separated from Little-ji, this body-mind- “guru”. That is your real fear. You do not want to be separated from that guy. You fear the loss of the body-mind-“self”. Your life is not principally about love of Me, love of Truth, Reality, Real God, love of the Master. No—it is about love of Little-ji, love of “self”, egoity, separateness. You are “bonding” to Little-ji, your worst intimate. No other intimate can hold a candle to Little-ji. You may fool around with an intimate partner, doing your “bonding” games with him or her, and with various friends and relations—but the game you are suffering most is your “bonding” to Little-ji, your separate and separative “self”, your own body-mind-complex. Therefore, this is the egoic “bonding” that you must transcend. You may give up your intimate partner, and concentrate in devotional “Bonding” to Me—but, until you give up your “bonding” to Little-ji, your practice in devotional relationship to Me will be no great ordeal, and it will not be effective. You need not struggle to give up Little-ji. Simply turn to Me. Do that consistently. Practice “radical” devotion to Me, moment to moment. “Bond” to Me—bodily, emotionally, with all your attention, with every breath. • Over 35 other black and white images—60 illustrations in total! whether I was in or apart from His physical Company. This is what I understand Adi Da to mean by “Reality Itself”. Beloved Da, How can I describe the feeling of seeing You sitting there and allowing all of us to pass through You to Infinity? I would so like to describe this undoing that occurs in Your Company so that very ordinary people like myself would learn of the Grace of Your Presence. In a moment, as I beheld His Beautiful, Radiant Form, I understood. The preoccupation with self, with the content of my life, and feelings and tendencies, my thoughts and neuroses—the whole “case” of self was felt as an utterly unnecessary and painful action, and was suddenly released. He established His Work of Eternal Silent Darshan for all time, to be Granted beyond His Lifetime through photographs and other representations of His Body that He has specifically Empowered for this purpose. Now, as then, if I behold Him with the eyes of the thinking mind, I see only a handsome, powerful, and deeply peaceful man. But if I come to Him ready to receive Him, putting aside self-imagery and self-concerns, I see Him with the eyes of the heart, and I am touched by a Radiance and Profundity that dissolves ordinary conception, perception, and presumption. A Supreme Divine Force was moving out from Your Divine Holy Body of Beautiful Light, and You Overwhelmed the entire space. . . . Your Descent from Infinitely Above was felt as Divine Conscious Light. As You Entered the head and the brain core, everything began to open to You in deepest ease. As You Moved and Pressed down into the fullness of the entire space, the breath stopped, the heartbeat stopped. . . . There was a brilliant Light associated with this Descent and joyous release. I could not move—yet, there was no dissociation, only awareness, only Contemplation of You. This is truly the most extraordinary moment in time. You are Manifesting Your Divine Form on Earth. Beloved Adi Da’s Love-Bliss Poured from His entire Being, Filling the room, and Saturating this being with His Perfect Resonance. I felt as though His Hands were pressing the chest outward with immense force, opening it to receive an enormous Ocean of His Love. And then that Resonant Fullness Poured from my chest, in reverberating waves of love that broke any sense of being an “I” at all. I felt like a sea opened to His Ocean of Love-Ananda, in an Immersion that never ends. In this Ocean of Undifferentiated Bliss, all is seen and known only as Beloved Adi Da’s own Form— All-Light, All-“Bright”, All-Love. You can find the full praise quotes in the book’s introduction. In these supremely precious Communications, Avatar Adi Da Samraj is ceaselessly Offering to all—in all times and places—the eternal and supremely joyous relationship to Him, the True Divine Heart of Reality Itself. My “Bright” Sight is a Gift to every heart, from the Divine Person of Love. Avatar Adi Da’s Word, Forever Speaking to all, is His Divine Agent, by means of which He bestows self-understanding and brings Himself directly to the open heart—enabling the heart to Sight Him with ever greater profundity and in ever greater ecstasy, and thus to receive His Blessing-Grace ever more deeply. Even as He Stands Eternally Free and Silent in His Divine State Only, Avatar Adi Da’s Word and the Sighting of His human Form Grant these Gifts to everyone. The Divine Siddha-Method of The Ruchira Avatar is a four-volume “Source-Text” by Avatar Adi Da Samraj—of which My “Bright” Sight is the second volume. This series of volumes brings together many of Avatar Adi Da’s most summary Discourses, Given throughout the years of His Compassionate Instruction of His devotees and the entire world. 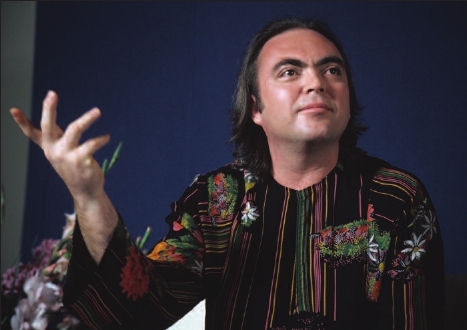 These Discourses are centered around certain core topics: the devotional relationship to Avatar Adi Da as the essence of the Reality-Way of Adidam, the fundamental practice of (total psycho-physical) devotional turning to Him, and the necessary transcending of ego-based life through “radical self-understanding”. The volumes of The Divine Siddha-Method of The Ruchira Avatar can be read either as independent books or as a closely interrelated series.